Oncology in Orlando, FL., May 29 -- June 2, 2009.
therapy other than ipilimumab (Study 007, Abstract #9033). 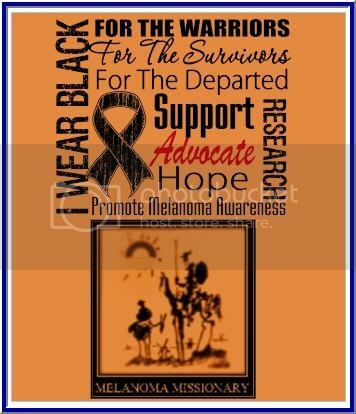 approximately 8 to 12 percent of metastatic melanoma patients were alive. common immune-related adverse events were rash, diarrhea and hepatitis. or impact the clinical effect of ipilimumab (Abstract #9037). is a measure of the number of immune cells in circulation. biomarkers of clinical activity of ipilimumab continues. subgroups of study 007 (placebo and budesonide, respectively). SATURDAY, May 30 (HealthDay News) --A vaccine for advanced melanoma has shown promise in a new study. Annually, about 8,000 patients are found to have metastatic melanoma presenting as recurrence of an earlier primary melanoma, and this number closely approximates the annual number of deaths from the disease. This statistic illustrates the lack of progress that has been made in the treatment of stage IV melanoma over the past several decades. As very nicely reviewed in this issue of ONCOLOGY by Bhatia et al, no therapeutic agent has been shown in randomized clinical trials to prolong survival in patients with metastatic melanoma. Chemotherapy with single-agent dacarbazine is the only US Food and Drug Administration (FDA)-approved chemotherapy agent for metastatic melanoma. Immunity to melanoma appears to be important for disease control in the adjuvant and advanced-disease settings. Spontaneous regression has been reported in melanoma, suggesting a role for host immunity. This possibility is indirectly supported by the regular presence of lymphoid infiltrates at the site of primary melanoma, a phenomenon that is frequently associated with histopathologic evidence of tumor regression. Host cellular immune response within melanoma has potential prognostic and predictive significance. T-cell infiltrates in primary melanoma are prognostic of disease outcome, and T-cell infiltrates within regional nodal metastasis predict benefit from interferon alfa-2b (IFNα2b, Intron A) therapy. [2-4] Immunologic approaches have yielded the only newly FDA-approved agent for metastatic disease in 30 years—high-dose bolus interleukin-2 (IL-2, Proleukin). This therapy is based on durable responses seen in some patients with metastatic melanoma, but with an associated high toxicity rate and cost. Currently the optimal approach to the management of patients with metastatic melanoma is treatment on clinical trials in an effort to maximize treatment options and provide access to promising therapeutic approaches for this disease. The future of melanoma therapy appears promising, with many novel experimental agents being tested in clinic, building upon the continuously deepening knowledge of host immunity and molecular circuitry of the tumor. Cancer vaccines continue to be actively tested in melanoma (peptide vaccines, genetic heat shock proteins, and dendritic cell–based vaccines). Molecular approaches to deranged signaling pathways and proapoptotic strategies are also being widely investigated. A phase III intergroup trial coordinated by the Eastern Cooperative Oncology Group (E2603) was recently completed, in which 800 patients with chemotherapy-naive metastatic melanoma were randomized to carboplatin and paclitaxel with either sorafenib (Nexavar) or placebo. The results of this trial are awaited. The roles of several critical regulatory elements of the immune system have recently been elucidated, providing insight into the disease process and new targets for overcoming tolerance. Enhanced expression of costimulatory molecules on the surface of dendritic cells is one approach to enhancing the presentation of tumor-associated antigens. This can be achieved through stimulation of dendritic cell receptors such as CD40 and Toll-like receptor 9 (TLR9). Another approach is to enhance or prolong T-cell activation by blocking negative-signaling receptors such as CTLA4. New strategies, such as the administration of oligodeoxynucleotides that activate TLR9, monoclonal antibodies (mAbs) that activate CD40 or block CTLA4, and costimulatory antibodies to CD137, or targeting regulators of apoptosis such as PD1 (programmed death-1) may provide more effective immunotherapies that might overcome tumor-induced tolerance. The closure of the tremelimumab phase III melanoma study for “futility” came as a surprise to many investigators, given clinical observations of durable benefits in some patients. The 1-year survival rate of > 50% for tremelimumab and the median survival of 11.7 months (compared with 10.7 months for chemotherapy) were also surprising, although this may have been the result of the selection criteria for this study. The exclusion of patients with 2× upper limit of normal lactate dehydrogenase (LDH) blood values and crossover of patients in the control arm to another anti-CTLA4 mAb may also have played a role in the results, but this remains to be clarified, and more mature survival and response data are anticipated. 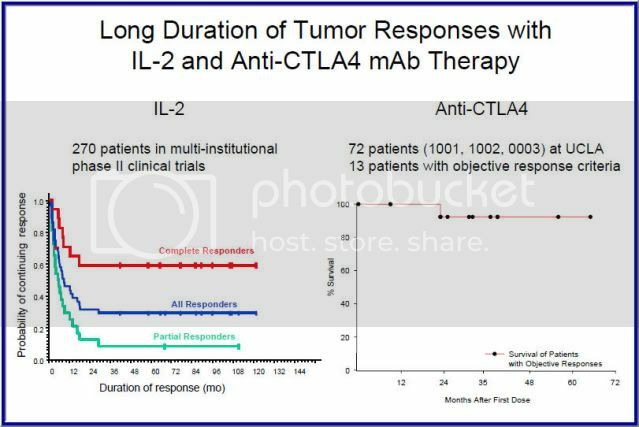 Results of the phase III studies testing CTLA4 blockade with ipilimumab (as a single agent or in combination with dacarbazine in one study, and administered in conjunction with the gp100 peptide vaccine in another study) are eagerly anticipated. Future research should incorporate the study of biomarkers to predict therapeutic benefit into randomized trials. This may lead to the identification of biomarkers enabling personalized therapy, which has become a Holy Grail of sorts, particularly in melanoma, for which standard options are so limited. Although subsets of melanoma patients clearly benefit from different approaches, these positive results have not been reproduced in classic randomized trials. Some clues could be found in the now repeatedly reported association between the induction of autoimmunity and therapeutic benefit with IFN-α2b, IL-2, and CTLA4-blocking mAbs. Revealing investigations might involve the induction of autoimmunity to a broad array of endocrine and tumor markers as biomarkers of therapeutic benefit. In addition, researchers may identify immunogenetic factors that predispose patients to induction of autoimmunity by these agents (eg, human leukocyte antigen genotype, polymorphisms of the CTLA4 gene and the FOXP3 transcription factor loci, as well as other immunogenetic markers). Multiplex analysis—encompassing cytokines, chemokines, angiogenic and growth factors, soluble receptors, signal transduction molecules, and other immune and endocrine markers—in relation to patient outcome could also be studied, building upon promising early results. [13,14] Important data along these lines could be provided from melanoma patients treated with adjuvant high-dose IFN-α2b (E1697), and planned adjuvant trials with CTLA4 blockade (ipilimumab, E1609). "From this work we conclude that Th17 cells may be implicated in the clinical effects of CTLA4 blocking monoclonal antibodies, and further study of their role in treatment-induced toxicities may help in elucidating how toxicities and responses may be differentially modulated with this mode of therapy." 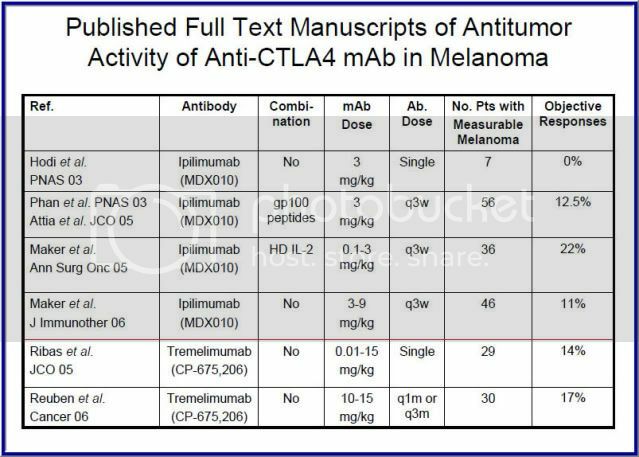 Source:CTLA4 blockade increases Th17 cells in patients with metastatic melanoma. Since I had a inflamatory response, I need to futher investagate the Th17 cells. We just may be getting a handle on this deadly disease!!!!!!!!! LOS ANGELES, May 14 (Reuters) - More than a third of advanced melanoma patients treated with ipilimumab, an antibody being developed by Bristol-Myers Squibb Co (BMY.N) and Medarex Inc (MEDX.O), continued to survive after 18 months, according to data released on Thursday. The 18-month survival rate for three Phase 2 trials ranged from 34.5 percent to 39.4 percent. Most trial participants had been previously treated with other therapies. "The median survival in the past was only six months," said Renzo Canetta, head of oncology research at Bristol-Myers. Two-year survival results are slated for presentation later this month at a meeting of the American Society of Clinical Oncology in Orlando. Bristol-Myers and Medarex said last year that they would delay seeking approval of the experimental treatment after U.S. health regulators asked for additional overall survival data to further demonstrate the benefit of ipilimumab. Canetta said Phase 3 data for ipilimumab in melanoma patients is expected to mature toward the end of this year or early 2010. Ipilimumab is a fully human antibody that binds to a molecule on T-cells that plays a critical role in regulating natural immune responses to disease. The drug is also being studied in other tumor types, including lung cancer and prostate cancer. "Metastatic melanoma is considered to be one of the most resistant tumors to standard chemotherapy approaches nowadays. Old anti-cancer treatments like dacarbacin (DTIC) or interleukin-2 (IL-2) continue to be the only approved treatments by the main worldwide health authorities. Up to now, no combination or new anti-targeted agent has shown an improvement in overall survival when compared to either of these two drugs alone. In fact, more than a dozen phase III randomized trials have tried to go beyond these old approaches, without meeting any success. Despite the fact that the median overall survival of patients diagnosed with metastatic melanoma is lower than 9 months, melanoma emerges as a challenging disease for testing new drugs and implementing the deeper knowledge in the molecular biology underlying this tumor. New immunotherapeutic targets have appeared recently trying to modulate the host immune response against the tumor. Furthermore, in the last three years, new targeted agents have changed the standard of care of other solid tumor types like renal cancer. We wonder if these new agents will be incorporated in the standard management of advanced melanoma patients in the coming years." Kurt's Story "The Battle with the Beast"
"I will try my best to impart Kurt's story to you. Kurt was a healthy, 28 year old man living in Bloomington, MN. He was a night manager for the IHOP Restaurant located near the Mall Of America. He was one of nine children and grew up on a farm in southeastern MN. Even as a child he would much rather be in the house cleaning or cooking than doing the outside work. He was very modest and you didn't very often catch him without a shirt or only on a real hot day would he be found in a pair of shorts. He enjoyed playing softball and was on a couple of teams through the summer. March 2008, Kurt's 92 year old grandmother was extremely ill in the hospital and in his haste to come to see her he slipped and fell in the shower which was in a tub. He hit on the edge of the tub with the left side armpit area. A month later he said it was still sore and he had a slight lump there. Kurt was a 6' 3", 210 lb. man. It was a hard fall and we assumed it was deeply bruised. The first week of May he went to a general doctor and she felt everything was fine on her examination. She thought that a lymph node may have been filled with fluid and to prevent an infection she wanted him to see a surgeon because they could possibly drain it. He saw the surgeon about 10 days later. They agreed with the first doctor. As they were checking things he noticed a mole on the right side of Kurt's back which had been there for at least 10 years or better and Kurt had not noticed any change in it. They did a punch biopsy. The Friday of Memorial Day weekend they called on the phone and told him it was Melanoma but not to worry because they got the whole spot out and they were sure it wasn't going to be a problem. They made an appointment for two weeks so they could check the lymph nodes and see what was happening. When that appointment came the swelling was worse. They decided to do a biopsy and it came back Melanoma. They then did a CT Neck, Chest, & Abd. Then they also did a PET Scan. The scans showed significant left supraclavicular and left axillary lymphadenopathy. A needle biopsy of a node showed metastatic melanoma. The Oncologist that he saw a Park Nicollett in Minneapolis said it was Stage 3 and the best treatment would be Interferon but it would be extremely harsh on the body. Our daughter works at Mayo Clinic in Rochester. Kurt had also worked there one summer and one of the doctors that they both were associated with was very concerned and he talked with Dr. Markovic who was a personal friend of his. It was arranged for Kurt to see Dr. Markovic. Kurt also met with an ENT specialist. ENT said that the mass was too large and going under the clavicle so surgery was out of the question at that time because it was such a vascular area that was involved. At the appointment with Dr. Markovic he suggested the best thing was a trial using Avastin. Kurt opted for the trial. We had received material prior to Kurt's appointment from Dr. Markovic on melanoma and treatments and outcomes. I asked Dr. Markovic what stage he thought it was and what type. He said it didn't really matter because it was serious. Come to find out later, they immediately classified as stage 4. At this time, I still never found out what type. My concern was for the 8 other children in the family in case it was familial or genetic in nature. 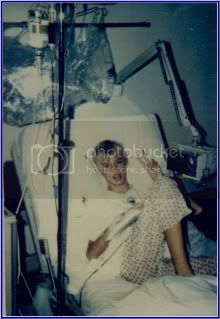 Kurt immediately started chemotherapy the next day. They called it the BEAM Study. It was one day a week, every three weeks by IV. He would receive Taxol, Carboplatin, and either Avastin or a placebo. They did three treatments and then did another CT Chest, Abdomen, & Pelvis. The results showed that the disease was continuing to progress. They then suggested protocol N0675 which was a combination of Temozolomide and RAD001, and the Taxol and the Carboplatin in pill form. (He was not getting the Avastin on the BEAM Study.) This would continue for 7 weeks. At the end of the 7 weeks they did a CT again and found the disease still progressing and now it appeared the lung was involved. They then decided to go back to the first treatment but not in the study so they could be sure he was getting the Avastin. They also decided to do it once every week. Kurt tolerated all of the treatments fairly well with minimal side effects. His arm was starting to really swell from the edema due to the lymphadenopathy though and that caused considerable pain. They could not get the pain down below a 7 on a 0-10 scale. Right before Christmas they repeated the CT. Some of the lymphadenopathy had gone down but it appeared to have spread to the spine and the liver. They could not do a treatment that week because his platelets were too low. They would proceed with treatments the following week. Kurt had shown them a spot down in the rectal area in November and they said it was a boil and would get better on its own. He showed them again in December and they weren't really concerned. In January it was draining and smelling. Around January 15 while he was having his chemo, Dr. Markovic came in and looked at it and decided to hospitalize him and have it lanced. Instead the surgeons took him to surgery and excised and biopsied it and it was melanoma. The surgeons got Kurt's hopes up because they thought they could go in and do surgery and reduce the mass in his chest and arm area. Upon examination they said there was no way. It was way to extensive. He could not continue with chemo until the surgery had totally healed. His hemoglobin was also very low so they had to transfuse 2 units of blood. When he went in to see the Doctor in February they still could not do chemo. By this time he was having tremendous problems with his arm and he was getting very unsteady. He was hospitalized again the middle of February due to the pain. They decided to try radiation and Kurt thought it was to reduce the mass so they then could do surgery. It was just to control the pain. They never did. Kurt was hospitalized again in March due to a severe rash. They figure it was just the cancer manifesting itself. They then at that point informed him and our family that to continue with any treatment would be more harmful than it would help. They wanted him to agree to no resuscitation but he wouldn't. He still felt he was going to beat the beast. I was finally able to convince him that it was for the best. He was transferred to a nearby healt care facility on March 18. He was getting 60 mg of Methadone and 45 mg of gabapentin three times a day. He was getting 100 mg of morphine every hour and sometimes if they were doing some type of care it was given every 20 minutes. All of this never really did cut the pain below a 7. He was also given drugs to try and calm him down so that maybe he would accept that he was dying. He lasted abou 2 1/2 weeks in the health care center. I feel that the doctors could have been a little more informative to him and our family. I am not saying they lied but if we didn't ask the question they weren't about to offer the idea or answer. Going through something like this you don't know what all you are suppose to be thinking about or asking. At the time they said they had done everything they could they said it was a very aggressive and fast moving melanoma but never have told us what type. Never have said that maybe the family should all be checked or be watchful or anything. I believe that no matter what the outcome was going to be the same. I have no bitterness and I am thankful Kurt was able to have the expertise and care available to him that he did. He fought very hard. It was just not meant to be. He is now out of that pain and despair and for that I thank God daily. Thanks for listening to Kurt's story. He had a tremendous birthday the other day, I am sure of it. I passed along your wishes." My heart goes out to the Graner Family. Being on the frontline of this war, I sometimes become numb on what is going on around me and what we are fighting for. This story helps me focus on the task at hand. We need to find a therapy that at the very least, stops the progression of this terible disease. We all need to work together to find a cure.